At the end of last year I decided to move to New Zealand and so alongside buying my flight tickets, I also signed up for the first edition of the Tarawera Ultra 100 miles. However, in January I changed my mind and decided that I would only go there for the race. 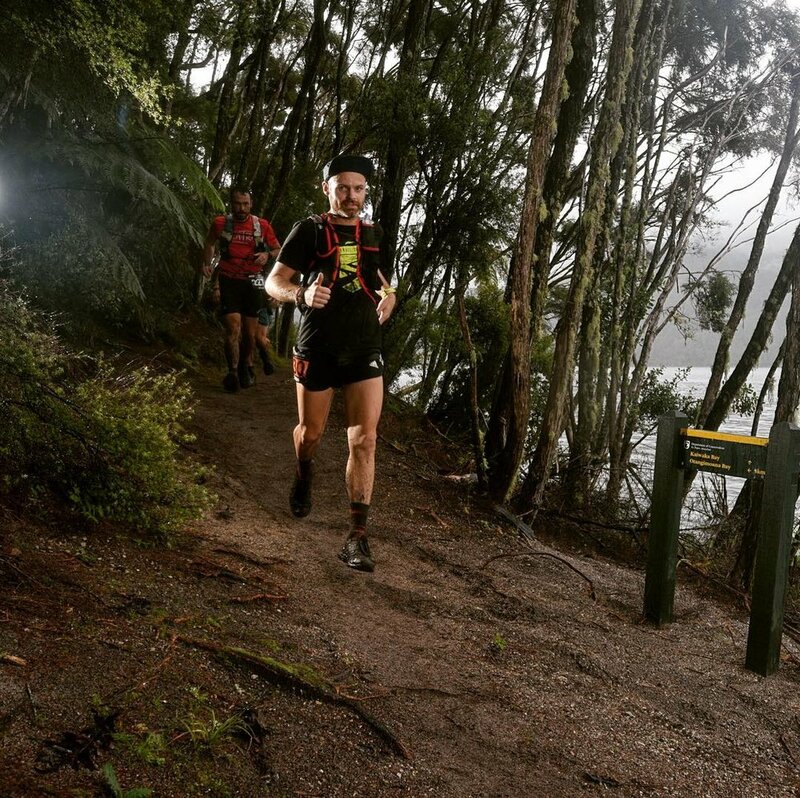 The Tarawera 100 miles Endurance Run is part of the Tarawera Ultra event which takes place on the North Island and also includes races of 102k, 87k, and 62k. The 100 miler consists of a loop around the Tarawera Lake, starting and finishing in Rotorua. The course is 162k long with 4800m of elevation. On the day before the race, I went to the expo with Nic, a friend from London, who was racing in the 102k event. We both registered that day and hung around chatting to other runners for most of the afternoon. I also bumped into Matt who I met in Patagonia a year earlier. He wasn’t a runner at that time but now he was running a 100 miler (yes after only a year of running, crazy right?). He told me that I was the one who inspired him to get into running; this really made my day and I was really excited to be at the start line with him. I then made my way to the start line and joined the other 140 runners who would take part in this crazy adventure. It was raining already and it was forecast to be raining all day… Great!! Just before the start we were greeted by a Haka dance (a traditional ancestral war dance from the Maori people). This was exactly what we needed to motivate us for this challenge/battle. Then, the gun went off and everyone started at a reasonable pace (5min/k), not yet knowing what was to come. I was expecting to see few runners storm off but everybody started sensibly. As soon as we hit the trail, the pace dropped a bit and as we got to the first climb, the lead runners started to walk up the hill. I decided to jog up, overtaking everyone in the process and leading the race for a couple of Ks. I was then caught up by Grant Guise. We ran together and played catch for over a 100k; it was really nice to have some company as I did not have a crew or a pacer… Grant is a very strong runner and such a cool dude! We had such a good time together. He really made my race! I had some stomach issues from 20k in up to around 100k, which made it very hard to stay in touch with Grant. Every time I needed to go to the loo, I needed to work very hard to catch him up. As soon as my stomach settled, I decided it was time to push the pace a notch and say goodbye to Grant… Hoping he would not be able to catch me later. I then was on my own leading the 100 miler but all the runners from the other races were really amazing and supportive. The support from the runners and the volunteers was simply incredible and it really kept me going. Someone shouted out I was the leader of the Miler (as they call it there) at the Blue Lake aid station and everyone went bonkers. It really was a special moment! I have to admit, I cried a bit after I left the aid station, overwhelmed by all the kind words… The 100 miler course then split from the other race course for an extra 15k loop, starting with a big climb. I decided it was the perfect time to ring a friend (sorry Svenja!) as I was getting quite tired and I was really stressed out not knowing how far back the other runners were. We had a good laugh and she told me “just push as hard as you can so you don’t have to worry about the others. If they catch you, it just means they are stronger and you’ll have nothing to regret”. I was really pumped up after the phone call and forged on. Everything was going to plan till about 5k before the finish line when a guy came flying passed me. I asked him if he was in the 100 miler and he said “yes”. I then started to chase him down but I just couldn’t keep up. I ran as fast I could to the finish but I couldn’t catch him up. I crossed the finish line 2nd and was a bit disappointed to have been overtaken so close to the end L. I found out an hour later that this guy missed the course split and went on the wrong course… He missed the 15k loop so he was disqualified. I was then officially the winner!! It was quite unfortunate for both of us as he did not do it on purpose and it kind of ruined the end of my race. I then went to bed for a few hours and met up with Nic the next morning for breakfast. He unfortunately had to drop out due to some nutrition issues. My legs were incredibly stiff! I guess the extra effort to run in the mud really destroyed my quads… After eating some food, we headed to the finish line where we spent 2 hours welcoming the last runners home (in the rain of course). It was so cool to see them coming in after being out there, running for around 35hrs. We often only talk about the front runners but I think the runners at the back of the pack are the real deal. You need some serious determination to be able to run for that long in such poor conditions. Troopers!! The 100 miler course is absolutely stunning and in beautiful weather it must be even more beautiful. The mud made the course very challenging but in dry conditions it should be so much fun and quite runnable. I would definitely recommend this race to anybody who can afford to go there (It makes it a very expensive race if you only go there for this). The volunteers and the crowd were so supportive and cheery, I had such a great time! I raced in the Inov-8 Roclite 290 the entire way (didn’t have a crew or drop bags) and except for a couple of blisters, which is to be expected when racing 100 miles in wet conditions, my feet were absolutely fine. They are really comfortable and grippy, perfect all-year round kicks.